It is easy to add popular email accounts to the Mail app on the iPhone and iPad and iOS knows how to configure them. 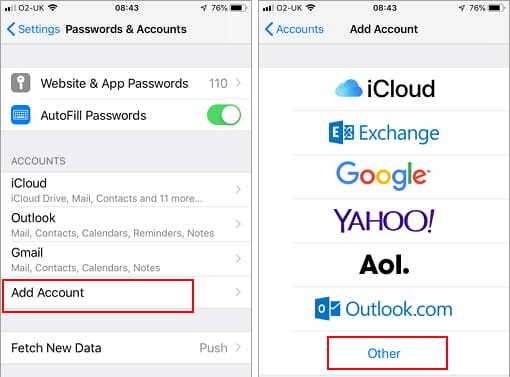 You can simply go to Passwords & Accounts, add a new account and select iCloud, Exchange, Google, Yahoo!, Aol, and Outlook.com from a menu. Just enter your email address and password and the account is automatically set up. There is an extra item on the menu called Other and this is used for every other email service provider. There are hundreds and possibly thousands of email services that fit into ‘Other’, so how do you set them up? For this you need to know the URLs for the incoming email server and the outgoing email server. Now this may be as simple as adding your email address and password because system guesses what the email server addresses are for incoming and outgoing email. If an email service is at xyz.com then then it assumes the email servers are at pop.xyz. com, imap.xyz.com or mail.xyz.com. This is often the case, but it is not always true and sometimes they are different. It means that the Mail app will not work until you have correctly configured the email account. 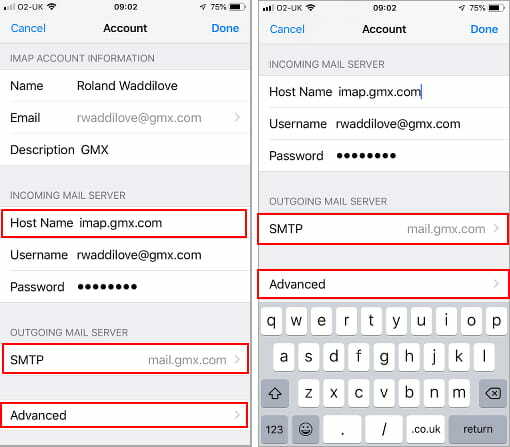 Here is a guide to setting up an ‘Other’ email account for the Mail app on the iPhone. GMX email is used, but he procedure is the same with other email providers, so follow the steps but using your own provider. Before you can add an ‘Other’ email account to your iPhone you must find the email server URLs for your email provider. The incoming server URL and and the outgoing server URL. I cannot help with this because it is different for every email provider. 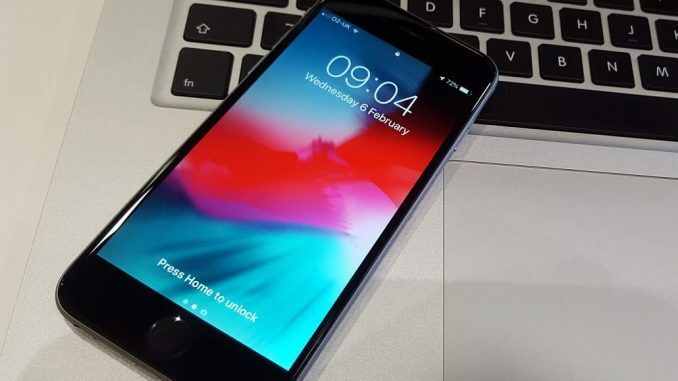 Open Safari on the iPhone or any web browser on a computer and go to the GMX website (or your own mail service provider). Log in to the email service and look for the settings. 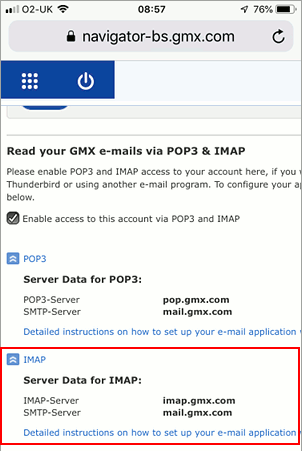 In GMX’s settings is a POP3 & IMAP section and this displays the email server URLs for POP3 and IMAP. POP3 vs IMAP: Use IMAP because this is designed to allow multiple devices – phone, tablet, computer – to access the email account. POP3 downloads email to the device, which means others can’t be used to read messages. This is the hardest step and some email services make it easy to find the mail server addresses, but some do not. 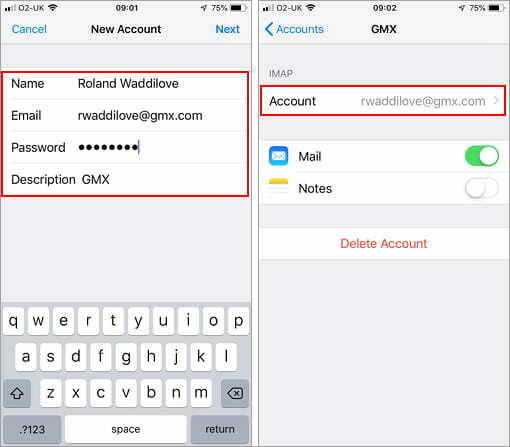 You may find the mail server URLs in the settings of your email account, as they were with GMX, but they could be in the help pages of the email service. You might even need to Google ‘mail servers XYZ’ where XYZ is the name of the email provider, or some variation of that search. Once you have the mail server addresses, the rest is easy. A list of common email accounts is displayed, like iCloud, Google, Outlook and so on. 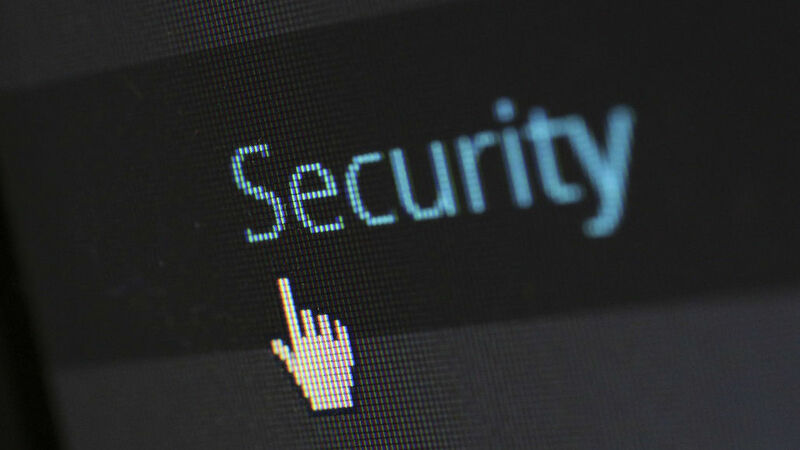 If your email account is not one on the list, press Other at the bottom of the list. You are prompted to enter the name of the email account and enter the email address and password. The iPhone Mail app will try to guess the email server URLs and it may or may not guess correctly. Don’t worry if it gets it wrong, we will check the settings and change them if necessary. If you end up back at the Passwords & Accounts screen, press your new email account and on the next screen tap your account. The email account configuration is displayed and it is important to check that the incoming mail server and outgoing mail server host names are correct – the URLs found in the first step of this guide. If they are not correct, tap them and change them. It is not always necessary, but if you cannot send or receive email on this account, it could be because SSL and the server ports are not set correctly. Incoming mail server port: Go to Settings > Password & Accounts > your email account > Account > Advanced. 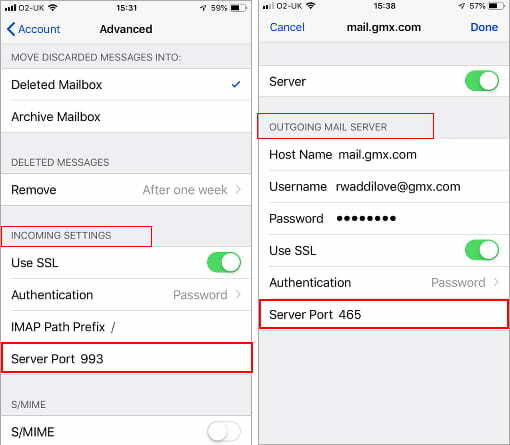 Outgoing mail server port: Go to Settings > Password & Accounts > your email account > Account > SMTP > Primary Server. Those two server ports in the screenshots are common ones, but check with your email service provider settings what the port numbers should be.